MAb VU-2G7 reacts with MUC1, a large transmembrane glycoprotein expressed on the ductal surface of normal glandular epithelia. MAb VU-2G7 reacts with MUC1, a large transmembrane glycoprotein expressed on the ductal surface of normal glandular epithelia. The dominant epitope of VU-2G7 has not been established with epitope fingerprinting. The extracellular domain of MUC1 largely consists of a highly conserved, O-glycosylated 20 amino acids tandem repeat which can occur 30-100 times per molecule depending on the length of the allele involved. In the vast majority of human carcinomas this protein is up regulated and poorly glycosylated and appears on the cell surface in a non-polarized fashion. 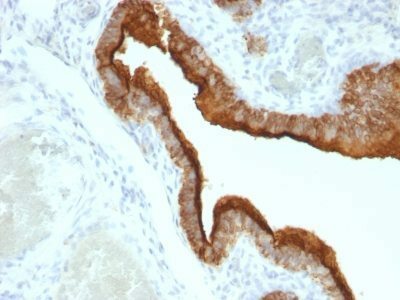 Catalog number key for antibody number 0630, Anti-CD227 (VU-2G7) The prefix indicates conjugation, followed by the antibody number and size suffix.